Most members of the Canidae family, such as wolves, dogs and foxes, are versatile and opportunistic animals, thriving in many habitats and some even living in urban and suburban settings. In contrast, Ethiopian wolves are highly specialised to life in the Ethiopian highlands. Also called the "Roof of Africa", it encompasses 80% of Africa’s land above 3,000 metres. The wolves are remarkable rodent hunters, with long muzzles and slender legs. Their tight social bonds help them protect their precious family territories from competitors. For a canid of their size (about 14-20kg – the weight of a medium-sized dog), Ethiopian wolves are unique at surviving on small prey (most highland rodent species weigh less than 100g) and are solitary foragers. With their striking red coats and black-and-white markings, they appear physically distant from their closest relative, the grey wolf. These qualities made the wolves successful colonisers of an expanding ecosystem as the African glaciers retreated during the end of the last Ice Age, but paradoxically, they have also contributed to their demise. Due to a warming continent, the tree line has gone up by 1,000 metres in the last 100,000 years, encroaching on open Afroalpine grasslands and meadows. Due to the pressure of humans, livestock and domestic dogs, the wolves are now restricted to tiny mountain pockets on either side of the Great Rift Valley, and are constantly being pushed up the slopes. Although they were never particularly common, today there are fewer than 500 adult wolves in the mountains of Bale, Arsi, Simien and Wollo, over half of whom are harboured within the Bale Mountains National Park. This makes them Africa's rarest, and most threatened, carnivore species. As an indication, this is ten times fewer than African wild dogs and fifty times rarer than lions. But there is hope. The Ethiopian Wolf Conservation Programme and its Ethiopian partners continue to put all their strength into fighting the wolves' various challenges through awareness, education and science-led approaches to disease and population management. The challenges they face are diverse. It's not for lack of food that wolf numbers are small. Their environments harbour a particularly high rodent biomass, up to 3,000kg of rats per km2 in some meadows. The wolves live in large family packs, where all members patrol and scent-mark the boundaries of small communal territories. This protects their rich food patches from neighbouring wolves, and other carnivores such as spotted hyenas and jackals. The most immediate and real threat to wolves is in fact domestic animals. While many highland wildlife species have been able to coexist with highland shepherds and their livestock, domestic dogs bring an additional challenge. The dogs not only compete for food but, as dogs and wolves are inexorably drawn to each other and interact, dogs transmit rabies and canine distemper virus to their wild cousins. This has the potential to decimate wolf populations in a short period of time. In extreme cases, dogs may even mate and hybridise with the wolves, threatening the genetic integrity of this rare and endemic canid. Disease ultimately determines the dynamics of the last remaining wolf havens. Three out of four wolves typically die in populations hit by outbreaks, and may result in local extinctions. In the last three years, populations in the Bale Mountains have endured back-to-back rabies and distemper outbreaks. Smaller populations are at even greater risk. At the end of last year, disease decimated the smallest wolf population in Wollo, now feared on the brink of extinction. The other great threat to the wolves is Ethiopia's changing landscape due to farming. Expanding populations and the need for arable land bring about an incessant pressure on natural habitats. By and large the people that live in the Ethiopian highlands are relatively tolerant of wildlife, but their priority is survival. Unless their livelihoods can be brought into line with sustainable practices, the meadows and moors they need for grazing, to gather firewood and tend their crops will soon be degraded to bare rock. Nevertheless, there are reasons to be optimistic about the future of the Ethiopian wolf. In the Bale Mountains, the Ethiopian Wolf Conservation Programme has vaccinated over 80,000 dogs to prevent rabies getting across to wolves. And when the deadly virus strikes, swift interventions to vaccinate the wolves have taken place. There are early signs that the wolves in Bale are bouncing back. By the end of January, nearly all of 18 local packs monitored – and most recently vaccinated – had bred successfully. 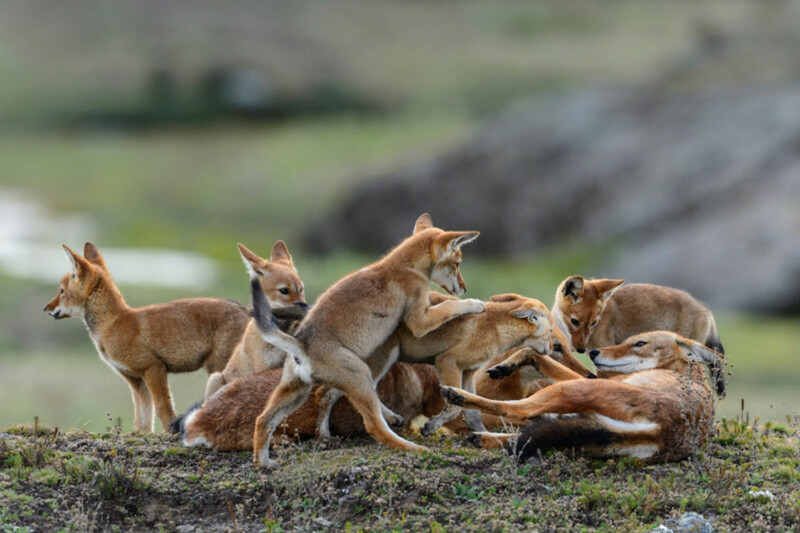 As many as seven pups were born to a dominant female and there were over 80 healthy pups located in the Bale Mountains alone. It was also encouraging to see some of the larger packs split, increasing the number of breeding families. In a shift from reactive vaccination of Ethiopian wolves following outbreaks to a preventive approach, an oral vaccine has been trialled. This will offer protection from future rabies outbreaks. Rare, ecological specialists such as these wolves will continue to be threatened as environments change and human populations grow. That means heavy intervention is needed to secure their survival. A critical factor in their preservation is the commitment and dedication to finding common ground between the needs of people and wildlife. For example, Ethiopia's long-term conservation view is that there should be no domestic dogs within protected areas. More can be done to facilitate this, such as improved night protection for people's livestock with predator-proof enclosures. This would reduce their dependence on guard dogs and, in time, reduce the negative impact of dogs on wild carnivores. Another key intervention would be to implement a metapopulation management paradigm under which isolated populations are treated as part of a single (or meta) population, and animals are trans-located between them. This enables recovery and a healthy flow of genes. In the meantime, our vaccination work brings us closer to the local communities and provides a channel of communication to transmit our environmental education message. In Alaska's Katmai National Park, rangers stumbled across a wolf carrying a very unusual meal. The ecological "pawprint" of domestic dogs is much greater than we thought. Meet the dogs of Kenya's Ol Pejeta Conservancy, who help combat the poaching of some of East Africa's most imperilled wildlife. Why is this fur seal thousands of miles away from home?